I was enjoying a potluck brunch at the First Baptist Church of the City of Washington DC (where I was raised) earlier this month, and some of us were discussing why some young adults are so easily recruited by what seems foolish propaganda online through social media. One of the other people said that the 1994 French film “Queen Margot” (“La reine Margot”) may illustrate how this happens. It is based in a historical novel by Alexander Dumas and is directed by Patrice Cherereau. 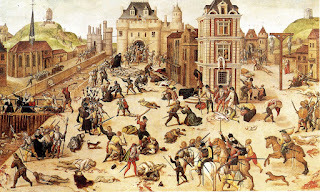 The religious conflict is in 15th Century France, between Catholics and Protestant Huguenots. It seems to incite violence very comparable to what happens in the Middle East, including Syria and Iraq, today. The plotting leads to the notorious St. Bartholomew’s Day Massacre of 1572, of Catholic mob violence. At the beginning, Catherine de Medici (Virna Lisi) marries her daughter Margot (Isabelle Adjani) to Henri de Bourbon (Daniel Auteuil), but she does not love him. Instead Margot has a clandestine relationship with another Protestant La Mole (Vincent Perez). Intrigues and violent retributions follow. Catherine plots to put her son the Duke of Anjou (Pascal Greggory) on the throne. There is a plot to murder Henri by contaminating a book with arsenic (something that would be akin to using anthrax today) but it winds up killing Charles. This is a violent, even grotesque film, and long (2 hours and 40 minutes). The Netflix video now comes from the Cohen Media Group, but the original theatrical release was from Miramax and was manipulated supposedly to draw American audiences. The film is also spectacular, with an opening wedding scene with music by Goran Bregovic. There are references to Handel’s Messiah, which could not have been composed yet; but period spectacles often use much more modern music than what was possible at the time shown (an interesting problem that comes up in my own screenplay concerning some particular music by Rachmaninoff). The complete film can be rented on YouTube for $3.99 from Entertainment-One. Curiously, the Netflix stream did not have subtitles for the French dialogue and titles. I don't think I've encountered this before. Wikipedia attribution link for Francois Dubois painting of the Massacre, Wikimedia commons public domain.